The gospels are dramatic, wild, and wet--set in a rich maritime culture on the shores of the Sea of Galilee. Jesus' first disciples were ragtag fishermen, and Jesus' messages and miracles teem with water, fish, fishermen, net-breaking catches, sea crossings, boat-sinking storms, and even a walk on water. Because this world is foreign and distant to us, we've missed much about the disciples' experiences and about following Jesus--until now. 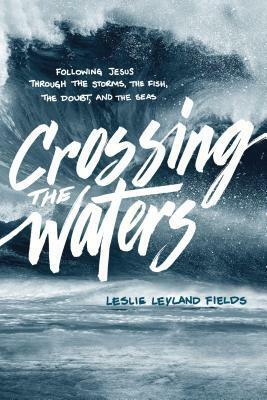 Leslie Leyland Fields--a well-known writer, respected biblical exegete, and longtime Alaskan fisherwoman--crosses the waters of time and culture to take us out on the Sea of Galilee, through a rugged season of commercial fishing with her family in Alaska, and through the waters of the New Testament. You'll be swept up in a fresh experience of the gospels, traveling with the fishermen disciples from Jesus' baptism to the final miraculous catch of fish--and also experiencing Leslie's own efforts to follow Christ out on her own Alaskan sea. In a time when so many are "unfollowing" Jesus and leaving the Church, Crossing the Waters delivers a fresh encounter with Jesus and explores what it means to "come, follow me." I really enjoyed this book. It takes a unique, and often overlooked approach to the Gospels, a look at the life of a fisherman and how it relates to Jesus' teachings. I've never been to Alaska, or on a fishing boat, or even in the ocean deeper than my waist, but Leslie has and this is both a testimonial story, and a reflection on what the Gospels really say. The Bible can often be understood both literally and theologically, but not often does someone live the life style described in much of the New Testament, the list of a fisherman, not as a hobby, but as a full-time, brutal and dangerous lifestyle. Seeing that life both in today's time, and taking another look at how it affected the thinking and teachings of 2000 years ago, we learn that while the Gospel is powerful on it's own, an understanding of what life looked like to the people of that time adds a whole new level to it's power, and our ability to understand it. When you see her, Leslie may be wearing a silk dress and fishnets or wearing Xtra-Tuff boots and mending fishing nets, depending on whether she’s at her fishcamp in the Alaska wilderness or on a speaking tour “Outside.” She’s happy in both places talking about the books, places and topics that move her most. Her book list includes The Spirit of Food: 34 Writers on Feasting and Fasting Toward God (Cascade), Surviving the Island of Grace: A Life on the Wild Edge of America (Thomas Dunne), and Parenting is Your Highest Calling . . . and Eight Other Myths That Trap Us in Worry and Guilt (Waterbrook), and five others. (Her forthcoming book is Forgiving our Fathers and Mothers.) Her essays, appearing in The Atlantic Monthly, Christianity Today, Beliefnet, Books and Culture, Orion, etc. take on a diversity of interests: garbage, a theology of the body, culture-making, motherhood, narrative theology and points between and beyond. Her essays have won Pushcart nominations, the William Wilberforce Award and the Virginia Faulkner Award. “As much as I love words on the page, I’m not fully satisfied until I get to speak them in person with others,” Leslie adds. She says she’s honored to travel and share from her passions nationally and internationally at conferences, universities, churches and retreats. With three master’s degrees, she has taught collegiate and undergraduate classes for many years, including six years in Seattle Pacific University’s MFA program. If she can’t see her audience, radio is a good second. She has appeared on more than 150 radio shows including Family Life Today, Prime Time America, Keepin' the Faith, Chris Fabry Live! Leslie’s a contributing editor for Christianity Today, and blogs at www.leslieleylandfields.com about life in her house, in the wild and on the road. She lives in Kodiak, Alaska with her husband and three school-age children. In the summer, her three older children return to their fishcamp island where cell phones don’t work, and where they all happily (sometimes) work together in commercial salmon fishing. Share book reviews and ratings with Stephanie - Adventures Thru Wonderland, and even join a book club on Goodreads. Stephanie - Adventures Thru Wonderland has read 6 books toward her goal of 52 books. All books reviewed on this site are either library books, bought by me, or gifted to me for review from authors or publishers. In order to remain unbiased and provide honest reviews, I do not get paid for my reviews. In order to offer giveaways from time to time to my readers, I am a member of Amazon Affiliates. This means that if you click on an Amazon link and buy a book, I can get a small commission. This does not cost the buyer any extra and helps me give back to my readers. Thank you!